New homes are now coming with a new style circuit breaker. 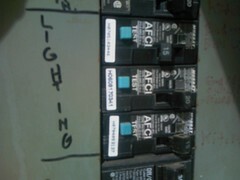 They are called AFCI and they do not work the same way as the older style circuit breakers. Older circuit breaker turned off when you reached the maximal amount of amp allowed on a circuit. A 15amp circuit turned off when you tried to use 15.1amp. AFCI circuit breakers have electronics in them that sense not only your maximum power limit but also how your power is being used. The pattern electricity makes on an oscilloscope is different depending on what you are running. Electrical arcing or sparking also has a unique power signature. It is difficult to find the cause of AFCI tripping. Currently they do false trip more then I like and some brands work better than others. The first think to look for is loose connections. Here is an example of the most common cause of AFCI tripping. This is the close up video of the loose connection. How a tight electrical connection will look. This did fix the AFCI tripping problem.